Singer Island is Palm Beach County’s tropical island resort located just 65 miles north of Miami and 160 miles from Orlando. Founded by sewing machine magnate Paris Singer, this beautiful island is a favorite destination for not just vacationing, but a wonderful place to call home. 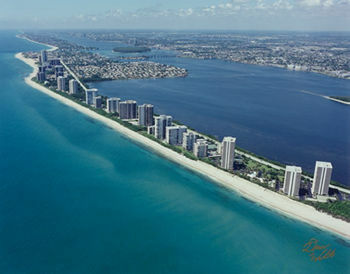 Singer Island is famous for its wide sandy beaches and warm gulf stream waters! A residential area with both single-family homes and condominium and apartment developments. The oceanfront at Palm Beach Shores offers a mix of marinas, hotels and motels and a large public beach and picnic area. Palm Beach Shores is located on the southern tip of Singer Island, approximately one-half mile square. A growing harbor community and popular with tourists since the first hotel was built in 1884, Riviera Beach’s attractions include the beautiful sand beaches of Singer Island and the busy Port of Palm Beach. The scuba diving (one of the best night dives in Florida is under the Blue Heron Bridge Spans in Phil Foster Park) and deep sea fishing here are world class.